While browsing the book kiosk at South Station, I came across this gem: Bad Baby Names by Michael Sherrod &Matthew Rayback. The authors work for Ancestry Publishing (affiliated with Ancestry.com) and all the names come out of the census records (1790-1930). More goodies can be found at their website. The authors occasionally augmented their text with reproductions of the census entries, which I appreciated. I would have liked a little more information (DOB, state) for each name, but it's a novelty book, so what can you do? There were a few questionable entries that I was not able to reproduce using Anscetry's databases. For example, the authors include Bart Simpson staples such as "Oliver Clothesoff," but the only example of that name I could find was in telephone directories from the 1990s. 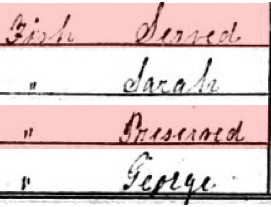 At other times, the census taker's handwriting is difficult to decipher, making it possible that "Goblin Fester" is really "Goldin Foster." Yes, the 1930 census has an entry for "Darth Wimbish," but I'm not so sure that it's not just an abbreviation for "Dorothy." Still, it was the perfect book for me to read while waiting around in South Station. That's really unusual... I never thought that people gave their children odd names long ago. "Children Writhing on the Pike and Halberd"
Is Freedom of Religion a Shield? "the Glorious and never to be forgotten 14th"